Unless you’ve been living under some kind of well-ventilated rock (with Uber Eats prolly) you’ll know all about a little film called Crazy Rich Asians. Starring Constance Wu, Awkwafina, Ken Jeong, Gemma Chan and Michelle Yeoh, Crazy Rich Asians is an instant classic rom-com that has brought praise aplenty for its representation of westernised Asians across the damn globe. What you’ll know if you’ve been lucky enough to actually see CRA is that the film is set in Singapore. TBH, we noticed immediately for two reasons 1) in some scenes the humidity has left its mark—not even movie magic can tackle that beast—and 2) there were some pretty good looking bars/hotels/experiences in that B-roll footage and we immediately recognised lots of ‘em. So, without further ado, here’s how to have a Crazy Rich Asians movie experience all of your own. BYO Nick Young or Rachel Chu. We all heard Rachel Chu land at Changi Airport in Singapore and rave about a ‘butterfly garden’. For many it was a moment that shattered the fourth wall, an OTT rom-com trope rehashed to make us believe life is awesome. But guess what? That couldn’t be further from the truth. Changi Airport has legitimately raised the standard of airports—nay, public spaces—everywhere. Along with things like an indoor pool, entertainment area, movie theatre and complimentary city tours, Changi boasts the world’s only 100 per cent legit, airport-based butterfly garden. With 1,000 butterflies and cascading waterfall, it sure beats a Maccas coffee and Dettol wipe shower doesn’t it? If you’re visiting we also recommend popping up to the rooftop pool for just $17SGD. The cost will get you use of the showers, a towel and complimentary non-alcoholic drink. Still not relaxed and pampered enough for the airport? Let The Kitchen by Wolfgang Puck treat you to well-crafted local and international dishes before a stay at the Crown Plaza Changi Airport. The World’s Best Airport Hotel (that’s not hyperbole, they legit won that title) has day rooms for stopovers under 8 hours as well as a 24-hour fitness room, spa treatments, restaurants and lounges. There’s not a single thing we like more than the term ‘Food Centre’ and Newton takes the cake (mmm... cake). A hot minute from Changi Airport, the Newton Food Centre is perfect for those who find themselves peckish the second their feet hit the tarmac. Local dishes like Hokkien mee noodles, chilli crab, BBQ chicken wings, popiah and satay skewers (just like the movie) are sure to hit the spot. Our personal faves are the fried oyster omelette from Hup Kee and chilli crab from Alliance Seafood, you just can’t go wrong with either. Top it off with carrot cake (very different from our version) plus a beer with mates and you’re laughin’. Yes, it’s that scene. You know the one, Nick and Rachel wake up in the hotel and aside from thinking, ‘Damn those sheets look comfy’ you’re sobbing, ‘Damn that man look pretty’. What’s important to know about Raffles—aside from it being a tiptop 103-room hotel—is that it has a famous gin-based cocktail called the Singapore Sling. Invented by former Raffles bartender Ngiam Tong Boon, the cocktail started off simple but grew to become a mix of gin, cherry brandy, Bénédictine, bitters, Cointreau, pineapple, lime juice and grenadine aka heaven. At time of publishing, Raffles is closed for remodelling but don’t worry, that’s just business speak for ‘glow up’. They’ll reopen during the first quarter of 2019 but if you can’t wait, head down to Seah Street where they’re keeping the authentic Singapore Sling experience rollin’ at a pop-up Long Bar. We’ve jumped forward a wee bit in the film, but don’t worry ‘cause we’ve reached a reference that includes the illustrious Awkwafina (whose rap career btw you should hit up on the ‘Tube). Bukit Pasoh Road, known for its bars and restaurants, is featured in the scene where Rachel reaches out to her college roommate Goh Peik Lin (Awkwafina) for advice on how to deal with the Young family. If you’re visiting the area, there’s a smorgasbord of bars to choose from but we have an affinity for Humpback which totes top notch seafood and a much-loved gin and tonic hybrid, the g’vine floraison & elderflower tonic. 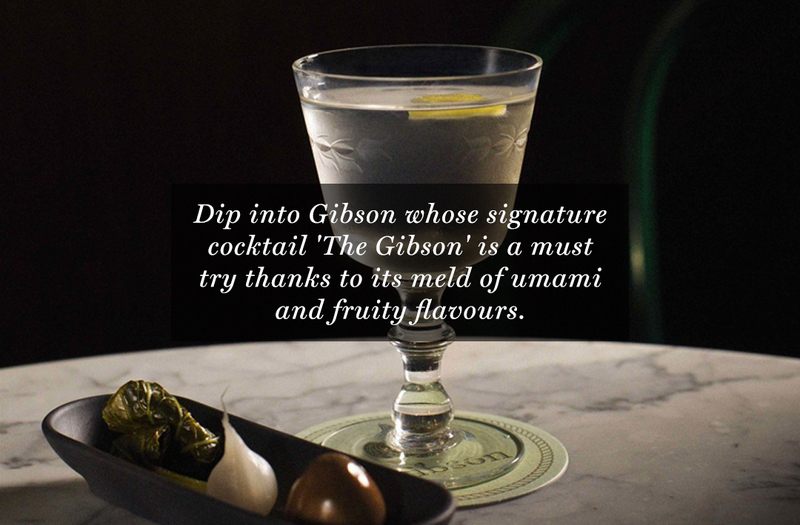 Failing that, a dip into The Flagship (home of the Old Fashioned) or Gibson whose signature cocktail, ‘The Gibson’ is a must try thanks to its meld of umami and fruity flavours. That’s right. You’ll recognise CHJMES (pronounced “chimes”) from that infamous CRA scene when Rachel decides to play chicken with Nick’s mother. We’ll all recognise the Gothic-style church as it is in the film, decked out in the most OTT tropical jungle theme of all time, but CHJMES normally sings a different tune design-wise with high-ceilings, pristinely white columns and stained-glass windows. While it’s obvi a brilliant place to visit at any time, we recommend popping by for an evening/night visit for a touch of romance only twinkle lights can provide. There are a number of great bars and restaurants too, so why not make a night of it? We’ll forgive you if you thought the fantastical Supertree Grove from that infamous CRA wedding reception was computer generated. But no, those tall, futuristic ‘trees’ are real and located in Singapore’s Gardens by the Bay. Measuring between 25 and 50 metres tall, the vertical gardens come alive at night with light displays and best of all… are totally free to visit. The site is open between 5am and 2am for you to re-enact Rachel’s dramatic runaway scene at will but if you like to see life from all possible angles the Grove is also viewable from the 22-metre-high OCBC Skyway (not quite so free at $8 SGD for adults), taking visitors on an aerial walkway through the ‘trees’ at set times. Consisting of a restaurant, SkyBar and club lounge, CÉ LA VI is as every bit glamorous IRL as it is in the CRA final scenes. On the 57th floor and perched on top of the Marina Bay Sands Skypark – with 360-degree views to boot – CÉ LA VI is best recognised as ‘that boat-shaped thing on those skyscrapers where Rachel and Nick’s love made me feel things’ – which… same. Start your Saturday with a sky-high lazy lunch (from 12pm to 3pm) before cocktails and champagne bring you through to a night of dancing. Every night is a little different too so make sure to book in your fave. Want more? Head this way for maximum travel inspo.